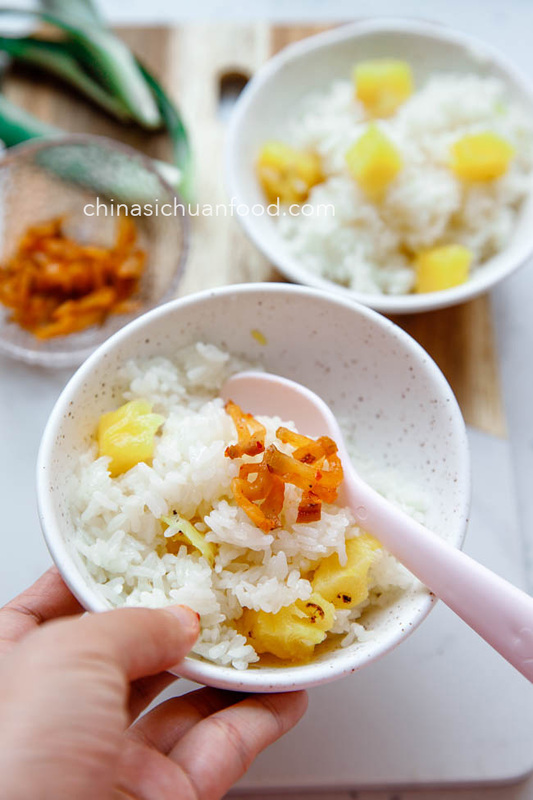 Sweet and soft pineapple rice in one pot. 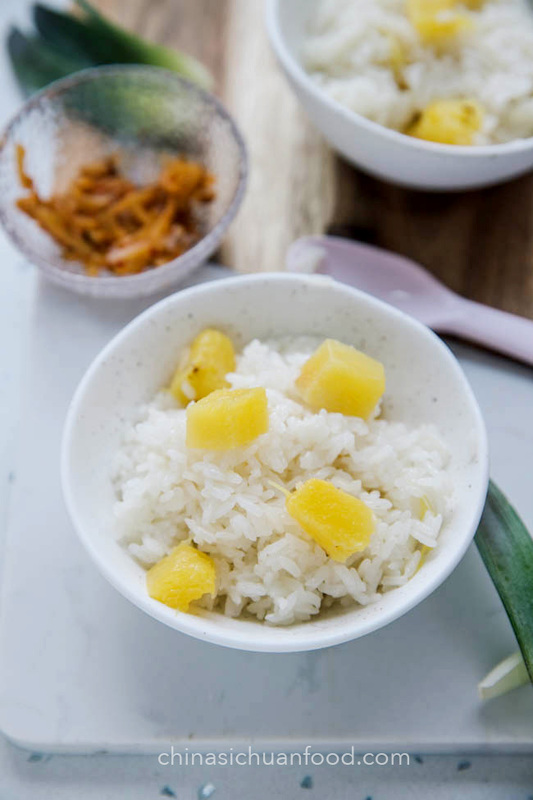 This staple rice has a strong aromatic of pineapple with a faint flavor of sweet and sour. It is pineapple season now. I crave for sweet and sour pineapples and the cooked ones are even better for my teeth. This is not Thai style pineapple fried rice (I love that version too though). This is original from China, popular in Taiwanese area and Xishuangbanna area where pineapple in widely grown. Nothing fancy about the recipe but I believe you will be amazed by how simple and delicious this rice dish should be. I take a bite of this version on a local birthday party and amazed by how simple it is and how great it turns out. I love the sweet flavor and soft texture of the cooked pineapple. 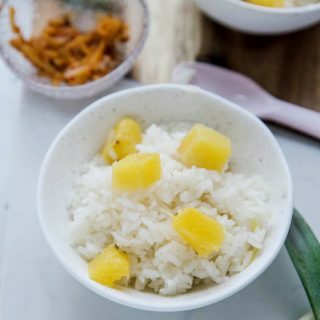 In Thai cuisine, people love to serve sticky rice with mango. That’s a rice dish popular across the world. Please believe me, this one is the same delicious and appealing. In order to make the final dish slightly sticky and softer, we mix in sticky rice (糯米) in. You can adjust the ratios for a better balanced taste and texture or you can use 100% sticky rice. In generally, sticky rice tastes better with sugar than common grains. 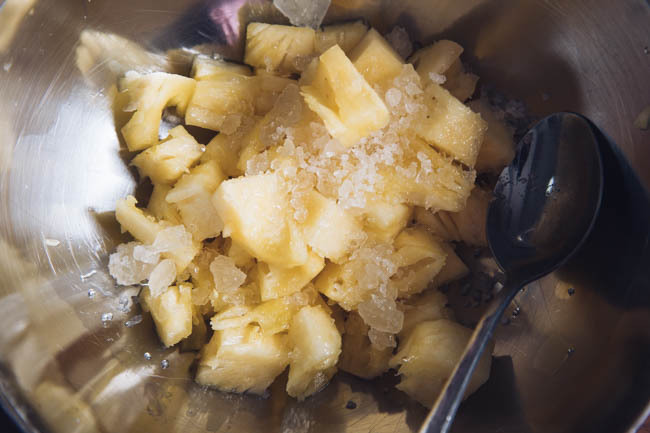 The key step for this recipe is to marinate pineapple cubes with sugar and let the juicy mix well with the grains firstly. This step can help to create a very uniform sweet and aromatic flavor. The key secret for this dish is to use sweetened pineapple juice to give each of the grains sweet and aromatic flavors. And at the same time, we keep the original pieces of pineapples, which can work as a highlights for the dish. 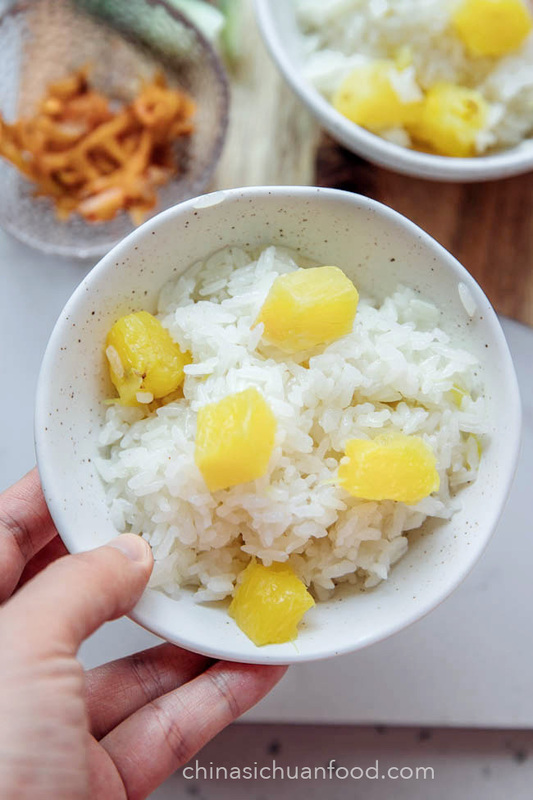 Simple sweet pineapple rice for sweet teeth. Cut pineapple into small cubes. By the way, I highly recommend discarding the hard cores. Transfer to a large pot. Mix in 2 tablespoons of sugar and set aside for 1 hour until there are juicy in the bottom. Gently squeeze the pineapple cubes for more juice, but do not break the shape. Wash both sticky rice and white rice and drain. 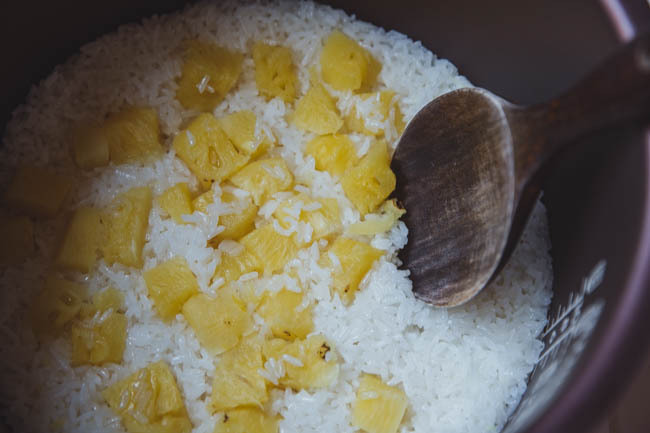 Place in a rice cooker, then pour in the pineapple juicy. Mix well. 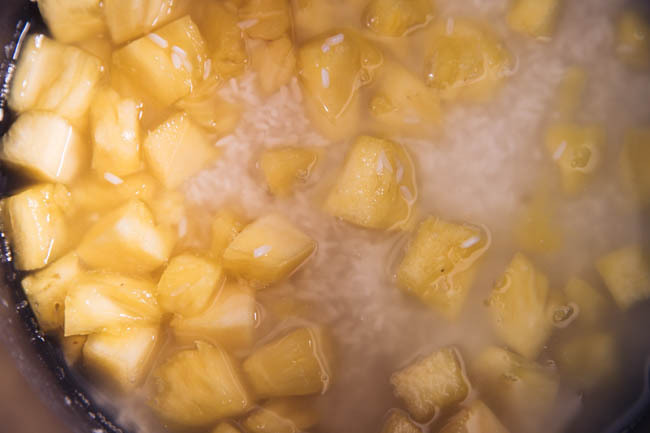 Add another 1 and 1/2 cup water and the pineapple cubes. Press “rice ”procedure and wait for the rice to be cooked. Serve with savory pickles or I recommend this shrimp stir-fried with breadcrumbs. They are the best partner together. 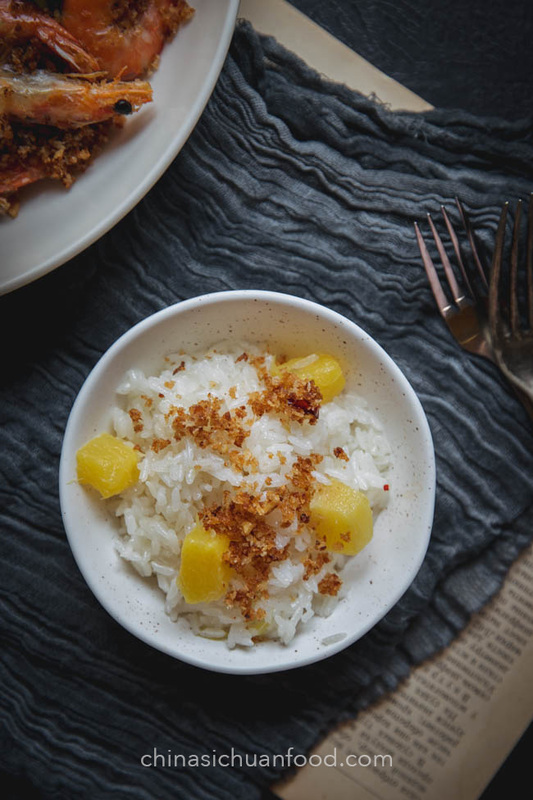 I matched this pineapple rice with a popular seafood dish- shrimp with breadcrumbs. Wow, that’s a combo!